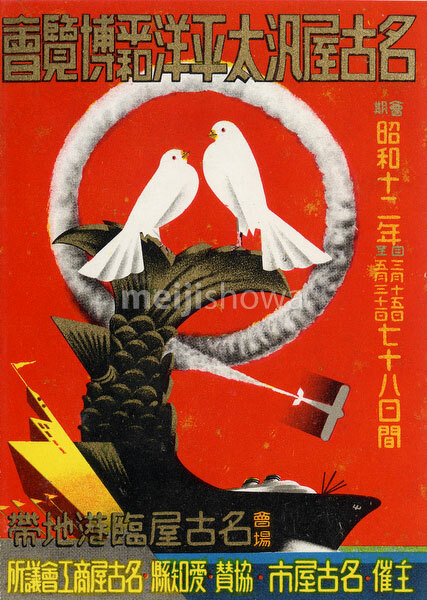 Poster card for the Nagoya Pan-Pacific Peace Exposition (名古屋汎太平洋平和博覧会, Nagoya Hantaiheiyo Heiwa Hakurankai), held in Nagoya, Aichi Prefecture, from March 15 to May 31, 1937 (Showa 12). The exposition promoted industry, transportation, education, science, construction, architecture, social welfare, tourism, fine arts and crafts and attracted 28 participating countries and 4,800,000 visitors. Two months after the exposition closed, the Second Sino-Japanese War (1937–1945) started.